I would say that the crushing useless feeling I’ve got when it comes to writing is a fairly new thing… it’s not. I’ve been struggling with writers block ever since I’ve started getting emotionally better. The inability to write has only intensified since I started taking antidepressants and stopped self-harming. As regards my mental health… it’s peachy. As regards my poetic creativity… it’s diabolical. That having been said – I reached out to those who follow me on Instagram. Now I know I said I’d retired myself from Instagram as regards my poetry but I couldn’t resist. And take to Instagram I did. Just what I needed. I asked permission to run with that concept, and run with it I did. This poem is free verse, and is the final draft for a previous poem, entitled Midnight Mistress, originally written about a city-based prostitute. I decided against following this idea as I was not happy with the narrator of the poem portraying the girl in a dirty, misogynist way. 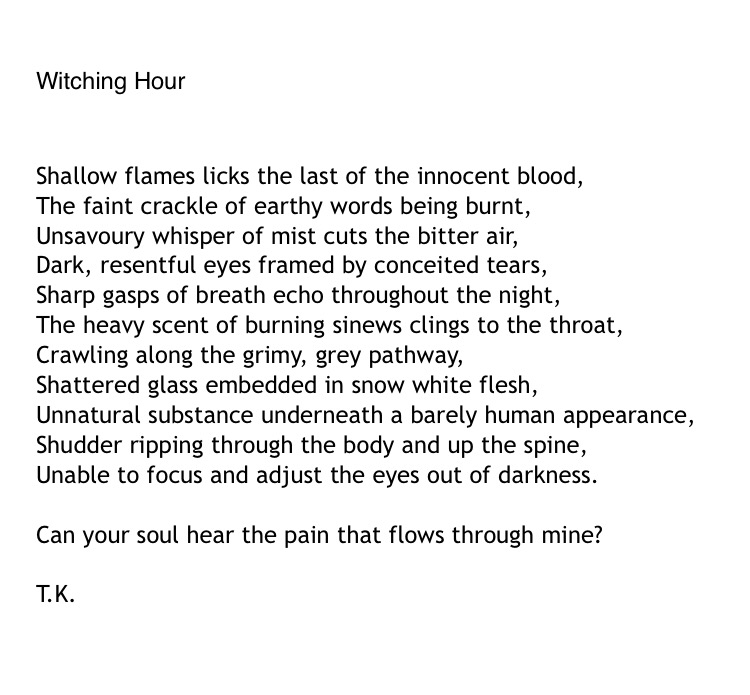 Instead, I re-worked the poem and moulded the subject matter into being an intense description of an un-named narrator describing their torment late at night – hence the use of the title ‘Witching Hour’ as it is only at the very dead of night that sights, smells, and sound like this can be found. 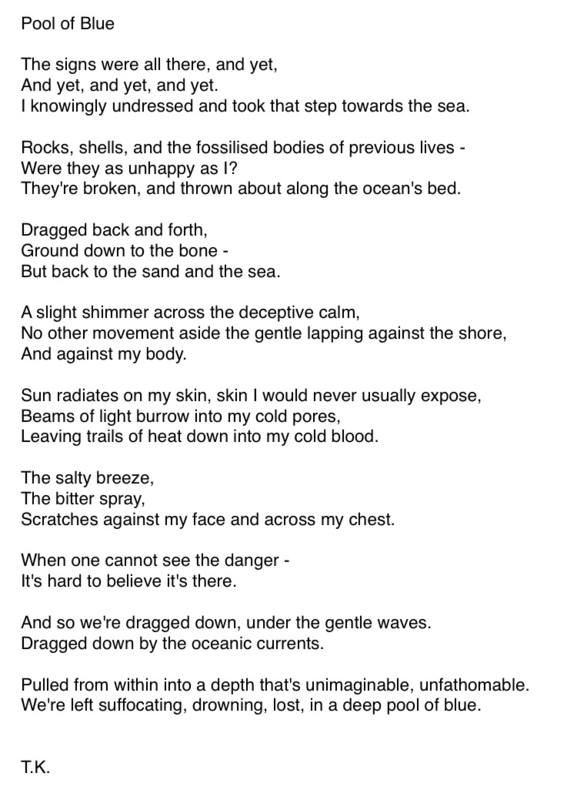 I used the painting The Broken Doll by Belgium artist Maria Isabelle De Keyser-Telghuis (1815-1879) as inspiration for this poem. The poem is in direct response to what is seen in the painting – namely a young girl clutching a porcelain china doll whose face is broken. I set the poem on the 30th November 1831, as it was on that day that the world experienced a solar eclipse. I wanted to explore the myths and superstations around this natural phenomenon and use these events as the build up to the little girl destroying her china doll herself. I researched the many different beliefs and supernatural concepts surrounding solar eclipses, and the behaviours of people when such an events occurs. The poem is laid out in four quatrains and rhyming (ABCD, ABCD, ABCD, ABCD), and a sestet rhyming (EFEFGD). 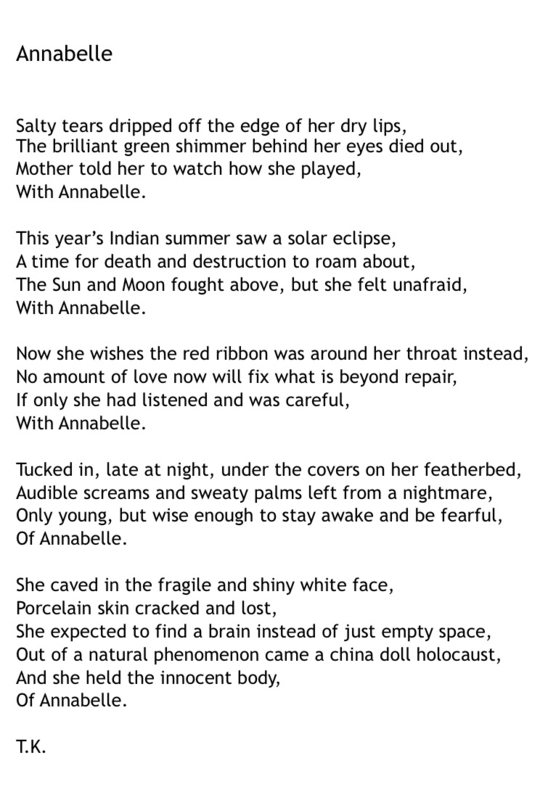 I gave the china doll a name, Annabelle, and that is what I decided to name the poem. I followed the rhyme scheme and the poetic structure of a traditional Shakespearean sonnet to create this poem – fourteen lines line made up of three quatrains (ABAB), and ending on a couplet (CC). The poem’s subject matter can also be seen follow the tradition of the Petrarchan sonnet as the octave celebrates the use of psychedelic experiences and allowing your id to control you, whereas the sestet mocks those who live in accordance to their ego and follows their superego’s moralistic lifestyle. 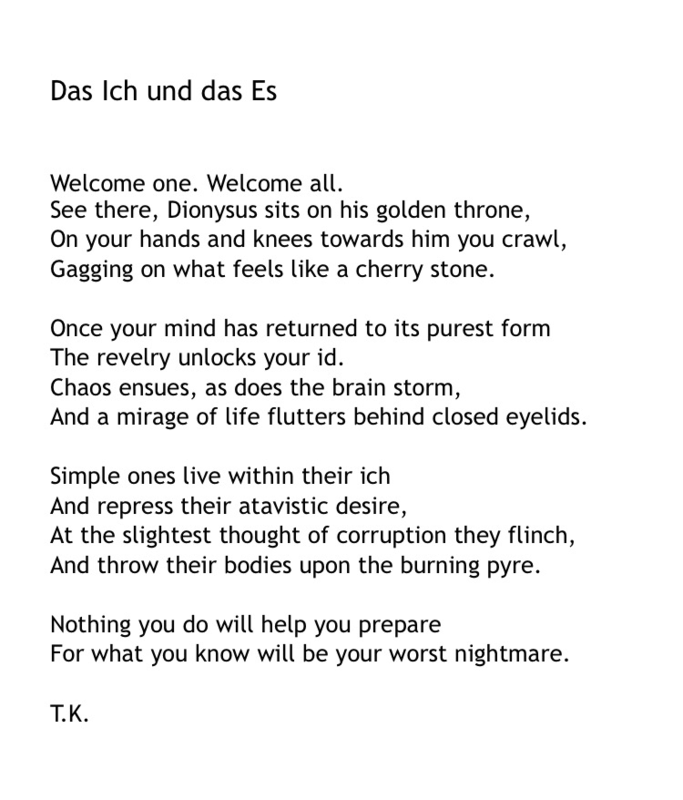 The inspiration for this poem I took from the etymology of the word ‘psychedelic’ – which stems from the Greek word psyche meaning ‘mind’ and deloun meaning ‘to make visible, or reveal’. To gain a fuller insight into the effects of such substance and the effect it has on the mind I read Aldous Huxley’s The Doors of Perception (1954), and William S.Burroughs’ Naked Lunch (1959). I also focused on Sigmund Freud’s paper The Id and the Ego (1923), which I not only quote in both English and German in the poem, but which is also the title of my poem. I decided to use the original German title of Freud’s paper instead of the translation to confuse non-German speakers in an attempt to mimic the confusion brought about by psychedelic substances.